Ace Canopy holds a function for kids in the wake of a 13-year-old Palmdale boy’s apparent suicide. 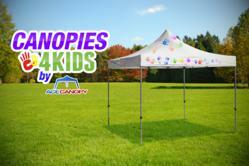 Ace Canopy will be at the Guidance Charter School in Palmdale for their "Canopies 4 Kids Program." The program consists of Ace Canopy showing up at the school with the company truck, they spread out a 30'X30' white canvas tarp and put a white 10'X10' pop up tent on top of the canvas tarp and all the school kids get to paint their hand prints on the pop up tent top and create designs on the canvas tarp. The student’s handprints are printed on the bottom of the tent and the teachers handprints are printed on the top – a symbolization of unity between students and teachers. An emphasis on community and peace is also implemented during the function. All the paint and all supplies are supplied by Ace Canopy and the tent and canvas tarp are donated to the school. According to CBS News, on April 15th, a Hillview Middle School student in Palmdale CA, Nigel Hardy was found dead in apparent suicide. There were reports of the boy being bullied at school. Abadak Inc, the mother company of Ace canopy and tarps plus, located in Palmdale felt the need to do something for the community that they are a part of. Although the canopies for kids program was scheduled before this event, the company now wants to expand the program across the Southern California area, with the assistance of the Mayor of Palmdale James C. Ledford Jr.
Abadak has recently started construction on a new facility in Texas that will enable the company to expand. Stein says he intends to expand the Canopies for Kids program in Texas by the end of 2013 and nation wide by the end of 2014.